I watched INSIDE MAN (2006) on 12.1.11. It was my second viewing of the film. This is a creative and well shot thriller with a solid script and well-toned performances. 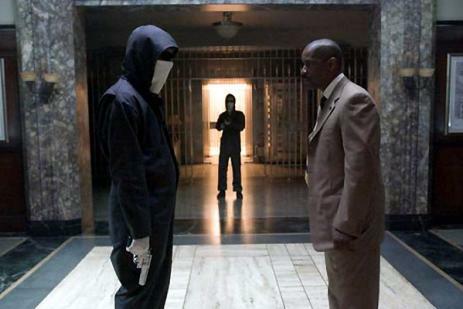 While not a perfect heist movie, it is absolutely an ambitious one. As directed by Spike Lee, this thing takes a carefully constructed course to its conclusion. Along the way we get to deal with race issues (one released hostage is thought to be an ‘Arab’ and so the police assume that the case around his neck is a bomb), class issues (Denzel points out to Christopher Plummer that his ‘1%’ bank owner leads a life which is nothing like the rest of society), and Nazi issues (won’t ruin that one for those who haven’t seen it). This is a very New York film in that every walk of life is presented. Key points of this film involve whites, blacks, Armenians, a Sikh, Jews, Latinos, rich, poor, old, young, and on and on. This is a movie subtly about the way a melting pot society is thrown together despite their differences, while on the surface being about a bank heist. Spike Lee is the perfect director for that. However, there are some missteps. When the leader of the bank robbers (Clive Owen) betrays the trust of Denzel’s Detective Frazier, Lee makes an interesting choice to show the latter’s rage. He places Denzel on a off-camera rolling pedestal which glides him from the street to the front door of the bank. The effect of this has Denzel coasting speedily through the air looking enraged, while the people on the street move normally. This works to take the reality out of the scene in a moment which should play realistically. On the other hand, Lee uses this same effect with the villainous Christopher Plummer sitting at a desk as it slowly moves in an opposite direction as the wall behind him. In that instance, the character in question was being talked about, he wasn’t literally in a scene acting something out. So it worked. Certainly this is all subjective. All of this may have worked oppositely for others. But the Plummer moment, for me, was right on, while the Denzel moment was a case of overdirection. Ultimately, this is a smart thriller. I still don’t know how Clive Owen got some of his information. Even if one of the people who turns out to be a henchman gives a couple of clues about his background, it still doesn’t explain how they know what they know. But I can let that go in the interest of this being otherwise very smartly written. Glad I got back to this, and I think it goes on my list to watch every couple of years. ~ by johnlink00 on December 2, 2011.